Outdoor stenciling has become very popular! Yes, you can stencil your deck, a fence, cement patio floor, or the pathway to your house. Our beautiful Mandala stencils look great stenciled on decks and patios. Allover stencil patterns create quite a statement at the entry to your home. Boring cement pathways can be stenciled in trendy herringbone bricks, and plain patio or balcony could use some Tile stencil patterns to turn it into a lovely alfresco space. We've stenciled some potting benches, rustic signs, old milk cans and even cinderblocks planters! 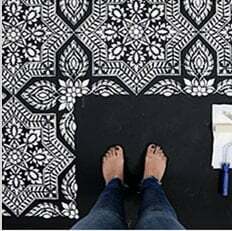 Watch our How to stencil videos and visit our Stencil Idea gallery get inspired for your next outdoor stenciling project!